Contact sensors are your first defense in home security. They allow you to know when a door or window has been breached. If a burglar breaks into your home, the alarm will sound and the police will be dispatched. We get one question constantly from our customers. They want to know, “How many contact sensors do I need to keep my home safe?” First, let’s understand what a contact sensor is. What is a contact sensor? A contact sensor is a two-part mechanism—a magnet part and a transmitter part. When contact is broken between the parts, it causes a broken circuit. In a security system, that broken circuit triggers the alarm and sounds the siren. Note: This post is for homes that are not prewired for a home security system. If your home is not prewired, it will require wireless contact sensors (which are described here). Some homes are prewired for a security system and if your home is prewired, check out our home security system offer for prewired homes. Ideally, you should install contact sensors on all your doors and windows. This is the solution that will give you complete peace of mind. When you have every portal protected by a contact sensor, you know if a burglar has entered your home. Whether you are at home or away, you know the instant that contact sensor circuit is broken. The alarm sounds and police are dispatched. Your type of housing and your primary fears/concerns determine how many sensors to have. We strongly recommend all portals be protected, but there are other factors to consider. The number of entry points determines the number of contact sensors you need. Most single-family homes have multiple points of entry, while multi-unit type housing tends to have fewer points of entry. For that reason, we categorize single-family sensor needs separately from multi-unit needs. 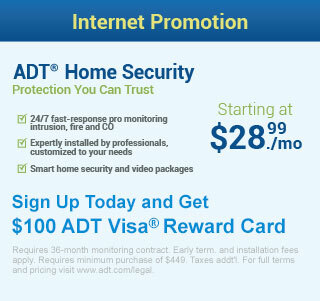 You live in a single-family home and you want a home security system to protect you and your family when you’re home. That is your primary motivator. In your situation, something—perhaps a previous robbery—causes consistent anxiety. Let me reassure you that that anxiety is justified. According to the FBI in 28% of reported burglary cases, someone was at home while the burglary took place! No one wants to be lying in bed hearing an intruder or stepping out of a shower to meet a burglar. That’s why we recommend that in a single-family house, contact sensors should help protect all your ground-level doors and windows. No matter where a burglar strikes, the alarm will sound and the police will be dispatched. Having sensors on all doors and windows is what gives you optimum peace of mind. Our home security package (which includes six sensors) will help protect the perimeter of most homes. If your home has more than six doors and windows in total, you may need to invest in additional contact sensors. Additional sensor may cost up to $169 each installed. Maybe though, you’re counting your doors and windows and it totals a lot more than six. If you’re sitting there multiplying the cost per unit for those additional sensors and feeling discouraged, you don’t have to be. But What If Your Budget Doesn’t Allow for that Many Sensors? If your home has so many doors and windows that your budget can’t afford it, what next? There are other options if you simply cannot afford the number of sensors needed. You should at least protect your doors and bedroom windows with contact sensors. Protecting the doors is obvious. You want to protect the bedroom windows for two reasons. First, that is where your family members sleep. Secondly, burglars hit the master bedroom first because that’s typically where they find the most valuable things to steal. Use a keyfob (keychain wireless remote control) to trigger the alarm if someone breaks in when you are home. When you don’t have contact sensors on all your windows (for budgetary reasons), your next level of protection is the keyfob. The keyfob gives you extra peace of mind in case you see an intruder outside. If someone attempts to break in through an unprotected window, you can trigger the alarm yourself with the keyfob. The siren will sound immediately, and the police will be dispatched. Did you know that pressing the panic button on your keyfob or your keypad is the fastest way to get the police to your residence? This is really important information, so please take time to read [see fastest police response time]. Use the motion detector for night protection. When you don’t have contact sensors on all windows, you should be using the motion detector at night (in “stay mode” – check out our blog: 5 channels of protection to learn more). You’ll need to figure out what works best about the motion detector depending on your family and nocturnal family habits. Some families stick to their beds at night so accidental activation is not likely to be a problem. We will work with you and your needs to ensure the best motion detector installation for your family. For budgetary reasons, most consumers go for our 6-sensor security system package. It includes a motion detector that secures your property from a break-in when you are out. When you are at home, your wireless keychain remote control (two included) is your best friend! Compare our offer with our competitors. You are likely to find that they only include two or three contact sensors, one motion detector, and NO KEYFOBS. Call 1-866-946-8419 now to take advantage of our limited time offer today. Perhaps you work long hours, have a second home or travel a lot. You’re away from your home frequently enough to worry about your possessions. All your doors—your front door, back door, and sliding doors because 70 percent of break-ins include a door. [Check out our blog: where burglars break in from]. All windows in room(s) where you keep your valuables, e.g., master bedroom. [Check out our blog: what are the most common items stolen in a burglary]. You don’t need to have sensors installed on the rest of your windows because we include a motion detector in our package. We install it for you where it will trigger the alarm if an intruder enters your house through an unprotected window. When a burglar enters an unprotected window, they head straight for your goodies. On the way to your valuables, the motion detector senses them and activates the alarm. Even though contact sensors don’t secure the rest of the windows, the motion detector can help protect you. If the Motion Detector Secures My Home, Why Do I Need a Sensor on the Master Bedroom Window? Typically, burglars hit the master bedroom first because that is where we humans store our valuables. Say a burglar broke in through the master bedroom window. Without a contact sensor on the window, burglar and valuables could go out the same window and not be detected by the motion detector. It’s a matter of knowing and understanding habits and patterns of burglars—and protecting yourself from known risks. On the other hand, say a burglar breaks in through a window without a contact sensor. As soon as they go through area where we’ve installed the motion detector on the way to the master bedroom for your valuables, the alarm will be triggered by the motion detector. Our package includes a total of six sensors, two keyfobs, and a motion detector. We can help protect most homes with this combination. Most multi-unit homes typically don’t have more than six entry points. You should have contact sensors installed on all the entry points where a burglar can break in. This includes front door, back door, and any ground floor windows. The good news is that for these kinds of dwellings, our offered package includes six contact sensors. This helps protect most of our customers without the need for you to invest in additional sensors. We believe so much in keeping our customers secure, that we’ve come up with an amazing package. You won’t find this elsewhere. It’s heartbreaking to see fear and anxiety in your family members. It’s also downright unnecessary. This package has the components that can help provide protection for almost every single family. Give us a call at 1-866-946-8419 now to talk about your needs. Home security industry statistics show that a high percentage of security systems are purchased AFTER a burglary. Well, that’s too late. Don’t let your family be one of those statistics.